Yana Kucherova was born in Russia in 1993. She studied viola with Maria Sitkovskaya at the Central Music School of the Tchaikovsky State Conservatory in Moscow, and continued her viola studies with Natalia Tchicth and David Quiggle at the Musikene Centro Superior del Pais Vasco in San Sebastian, Spain. Ms. Kucherova has performed as a soloist and an orchestral player at the Tchaikovsky Grand Hall of the Moscow State Conservatory, where a number of the concerts were conducted by Mikhail Pletnev and Yuri Simonov. She has been a recipient of several awards including the “Best String Player” prize at the 2015 Intercentros Competition and the 2016 AIE and Igartza scholarships in Spain. 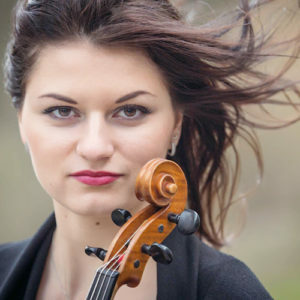 She has participated in master classes with Gerard Caussé, Maxim Rysanov, and Yuri Bashmet, and performed with violinsts Guiliano Carmignola, Tatiana Samouil, Sergey Ostrovsky, and cellist Pavel Gomziakov. Since September 2016, Ms. Kucherova has been an Artist-in-Residence at Queen Elisabeth Music Chapel working with Miguel da Silva. She is also a project participant of the “Les Dissonances” ensemble, which was founded by violinist David Grimal.